The symbolism of Black Butterfly myths, legends, superstitions and related folklore from around the world. 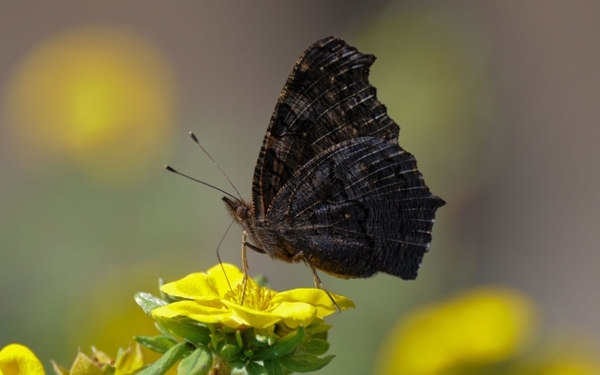 Black butterflies are not as commonn as butterflies of other colors. The symbolic meaning of them sometimes positive, and sometimes omnious. Many believe that if the first butterfly of the season that one sees is black, that thunderstorms are coming, or the season will have more rainfall. A black butterfly is generally considered a symbol of misfortune and an omen of death in many cultures, while in others, it is a sign of positive change. Black butterflies have numerous personal meanings depending on what a person believes. The 'death' indicated by the black butterfly can also be interpreted as a death of 'something' rather than a person, such as the end of a relationship, job, or even an idea or project. In many cultures, it is believed the black butterfly is a symbol of transition, renewal or rebirth. An encounter with a black butterfly can indicate that the person is about to be reborn or renewed in some way. Sometimes there is darkness before the dawn. Black butterflies are also symbolize longevity in some cultures. The black butterfly may also mean that a shift in power is about to occur. Seeing a black butterfly can also be a sign that a positive change will occur in a present situation. In many parts of the world, especially Central America, Philippines, and China, black butterflies are considered as a symbol of death. Black butterflies (and moths) seen indoors is often considered a warning that the death of someone in the house will soon occur; or, it can indicate that there has been a recent death or illness of someone in the house. Irish and Celtic legends say that black butterflies are also the souls of deceased people who are unable or unwilling to move on to the afterlife; they may return to the place they once lived or somewhere they were fond of visiting when they were alive. Some cultures associate the black butterfly with witches. An odd old legends say that a black butterfly flying around the home is a witch that has trasformed themselves into the black butterfly in order to steal food. In Aztec mythology, the warrior goddess, Itzpapalotl is associated with the black butterfly and even referred to by name as 'the Obsidian Butterfly'. A strange old Aztec myth describes how Itzpapalotl camouflages herself as a black butterfly to devour souls during a solar eclipse. The black butterfly represents change, transition, freedom and rebirth. The associations with death and misfortune can also symbolize the 'death' of something bad or negative, or the end of misfortunes. The Butterfly itself is a symbol of death, rebirth and transformation. While in its coccoon, the Caterpillar seems to die, but is soon lives again as a butterfly. Black colored butterflies are also associated with power, authority, sexuality, mystery, sophistication, elegance, anger, fear, evil, sadness, death, mourning, remorse and the unknown. The Black Butterfly symbolizes new life from an old one. The Black Butterfly symbolizes the new strong but subtle life after a period of transformation."